The Manor House Apartment is located within the Manor House with its own private entrance. In the midst of this remarkable landscape, Clos Mirabel offers several choices to stay in comfortable, recently renovated and well-equipped furnished accommodation, holiday lettings and Bed & Breakfast whether for work or leisure: The Manor House sleeps 14. The Manor House and its Apartment sleeps 16, or 20 with The Winery. The Gatehouse (sleeps 6). The Manor House Apartment (sleeps 4). The Winery Studio (sleeps 2/3) and the Loft Apartment (sleeps 4/5). B&B is also available in the Manor House with buffet breakfasts of local & regional produce that can be taken in the dining room or out on the terrace. Rates from 110 -159 Euros per night per room including breakfast. French-Ca­na­dian An­dré is a re­tired di­plo­mat; Ann worked in the trav­el in­dus­try and public af­fairs. They both have a keen in­ter­est in health and well-be­ing which is re­flect­ed in their choice of Clos Mira­bel and its out­s­tand­ing lo­ca­tion look­ing over vine­yards, out to­wards the en­tire chain of the Pyrénées At­lan­tiques. Ann has a keen in­ter­est in psy­chol­o­gy; Emi­ly at­tend­ed French school and fin­ished her se­condary ed­u­ca­tion at the in­ter­na­tio­n­al school in Pau. Much trav­elled Ann and An­dre fell in love with Clos Mira­bel and its breath-tak­ing views over 13 years ago. They lived in the 18th Cen­tu­ry Manor House for 2 years be­fore un­der­tak­ing a ma­jor ren­o­va­tion in 2005 re­tain­ing as many of the his­tor­i­cal fea­tures as pos­si­ble. The orig­i­nal house at Clos Mira­bel was a very sim­ple Béar­naise farm­house built be­tween 1732 and 1738. A small barn was add­ed a lit­tle lat­er. In 1825, the prop­er­ty was purchased by Jean Mira­bel, hence the name, Clos Mira­bel. At the same time he bought sev­er­al acres of land that in­clud­ed the vine­yard. Set in 15 acres of park­land the Clos Mira­bel Es­tate of­fers you a chance to re­lax in a peace­ful sett­ing. Clos Mira­bel pro­vides a hill­top haven in Bed and Break­fast and Self Ca­ter­ing Ac­com­mo­da­tion where vis­i­tors feel re­freshed and in­spired. Ev­ery­one can en­joy the park at their lei­sure. It of­fers swings, swim­ming pool and tram­po­line for some, ex­plo­ra­to­ry walks for others or sim­p­ly re­lax­a­tion in the shade of our oak trees. Ad­mire the mag­ni­f­i­cent un­in­ter­rupt­ed views of the en­tire chain of the Pyrénées At­lan­tiques. The large mo­sa­ic tiled pool in the Clos Mira­bel grounds is avai­l­able to all guests from May to mid Oc­to­ber. Part­ly so­lar heat­ed mea­sur­ing 12×6 me­ters and with a depth of 1-2 me­ters, it of­fers amaz­ing views of the vine­yards and Pyrénées. Sun loungers, gar­den fur­ni­ture and bar­be­cues are al­so pro­vid­ed for your re­lax­a­tion. Separate WC on the ground floor and full bathroom next to the Master Bedroom under the eaves with large walk-in shower, wash hand basin and WC. Mosaic and white tiled throughout with lots of light. Private park of 5 hectares for all guests to enjoy. International kayaking centre in Pau. Half and full day excursions can be arranged. Private park of 5 hectares South facing terraces overlooking the Clos Mirabel vineyard and the Pyrenees. The large mosaic tiled pool in the Clos Mirabel grounds is available to all guests from May to mid October. Partly solar heated measuring 12x6 metres and with a depth of 1-2 metres, amazing views. The Manor House Apartment is fully independent. It covers 3 floors and is full of natural light with lovely views out over the park. The bedrooms are well separated and private. The Apartment benefits from use of the large south facing terrace overlooking the Clos Mirabel vineyard to the entire chain of the Pyrénées Atlantiques; Ideal for l'apératif and 'al fresco' dining.The large outdoor pool, heated by solar energy is also there for your pleasure as well as any of the amenities of the park (swings, trampoline, climbing frame, badminton, boules). Linen and cleaning can be provided at an extra charge. A very special place to stay ! The property lived up to all expectations and more. Beautifully clean and well maintained. The owners were incredibly friendly and helpful . We opted to have breakfast all week and really enjoyed meeting other guests. Pau is a really lovely city and just a short drive. It was hard to leave - the views from the grounds are simply breathtaking. Thank you for taking the time to write a review. We hope to be able to welcome you back again at a future date. The highlight of our stay in France!! Great service, amazing location and views. So much to do in the area. The apartment had everything we needed and we loved relaxing in the grounds and by the pool. The hosts were charming, you are made v welcome and nothing is too much trouble. We were given info about how to find accommodation for our daughter's time at the University, where to get the best cheese, who was the best ham provider, the most enthusiastic wine grower etc etc! Make sure you see the kiwi tunnel! The spiral staircase is not for the faint-hearted and would be unsuitable for the elderly or young. Go, you'll have a lovely time!! We loved the location and site of Clos Mirabel. The three-story apartment was comfortable and attractive, and the beds very good. Especially nice is the pool and the setting and visitas of the property. We made day trips easily to Biarritz and area, the Pyrenees, Lourdes, and of course Pau. Area restaurants are good, although the one-star Michelin nearby was the "emulsion-froth" type of cuisine! The owners Ann and Andre and their daughter are very pleasant. I would recommend that they provide written specific instructions for the dishwasher, clotheswasher, BBC on TV, and A-C-- instead of being called on each time that help is needed. And that they run through a check list to ensure beach towels, detergent, or basics are ready and in place. Same for a diary for and by visitors, with local recs added by each in turn, to leave in the apartment. The property was clean and really very lovely-- much better than staying down in Pau! I would go back again! We stayed in this charming Manor House Apartment for a week. The apartment is comfortable, light, well furnished, very clean and there is excellent attention to detail. The hosts Ann and André are very friendly and helpful. They willingly share their local knowledge and make suggestions about regional attractions, eating places and most things you might want to know. The surroundings are beautiful and the mountain views stunning. When we ate in, we took our meals and wine out to the pool surrounds and enjoyed being in such a beautiful place. We certainly recommend Clos Mirabel as a great experience in itself and as a convenient base to explore the fantastic French Pyrenees, together with the wine and cheese trails. 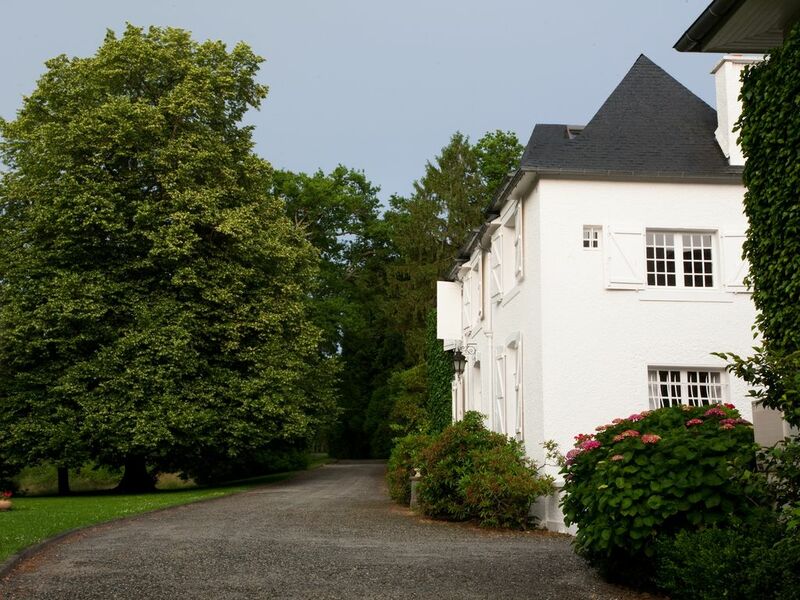 Situated 5 kms from Pau, between ocean and mountains, Clos Mirabel is 1/2 hour from Lourdes, the Pyrénées National Park and less than 1 hour from the French and Spanish ski resorts, the Atlantic Coast with its surfing beaches, sailing and some of the loveliest golf courses in France. Biarritz, St Jean de Luz and San Sebastian are within easy reach as are Bilbao and the Gugenheim, and Santander. Situated in the heart of the Jurancon vineyards it is ideal for walking and climbing holidays, golf, skiing, wine tasting and gastronomy.. The region is known for its food and wine. Clos Mirabel is very close to Pau and all it has to offer: its Chateau, Casino, golf courses, race course and show jumping events, its Grand Prix. Pau Pyrénées airport is 20' away with flights to London, Bristol, Amsterdam, Brussels, Paris and Lyon. Lourdes Airport is 30 minutes, Biarritz 1 hour, Toulouse 2 hours.